Herbs are so delightful, everyone should grow their own! Each year I plant herbs in large pots and those will provide me with fresh herbs all summer long and enough to harvest for winter cooking. I am up to my elbows in making frozen herbs, herbs in oil, vinegars and... herbed butter. 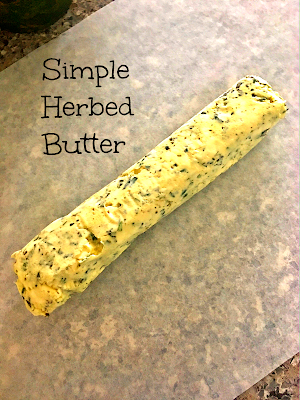 Herbed butter is a wonderful way to preserve herbs for winter use. Drying herbs weakens their flavor a bit so you have to use more to get the flavors you want. Using herbs in butter actually helps preserve their natural flavor. You will be glad to have a freezer of butter in the winter months. To get started, here's what you need to do. Get out your butter (2 sticks). Butter matters, folks. Use a high grade butter for this process for the best flavor. Let it soften on the counter while you go out and cut your herbs. Let's talk about butter for a bit. I like to use salted butter in this process. Salted butter is the one covered in waxy paper. Sweet butter (unsalted) is wrapped in foil. The foil helps keep it fresh. Did you know that little tidbit of information? Go outside and get your herbs. You can cut all of the same herb, or do like I do, and that's collect a variety of different herbs. I like variety. That's how I roll. You will need about 2T of herbs for a stick of butter, so about 4T for the two sticks. While your butter is hanging out, strip the leaves off the stems of your herbs and do a rough chop. Add some olive oil, about a tablespoon, and continue to chop until the oil changes to a green color. I like to see bits of the herbs in my butter, so don't mash them too much if you are like me. Get out your mixer and your whisk blade if you have one. Whisk up that butter until it is smooth and nearly melts upon touching it. Pour in your herbs and oil and mix well. Pour butter onto a piece of waxed or parchment paper and using the paper, make a roll. Fold up the ends of the paper and place into the refrigerator until hardened. Once the butter is hardened, you can portion out sections by cutting it and then wrapping it in waxed paper and freezing it. So, what do I use herbed butter on? 1. Steaks. This is my husband's favorite way. 2. Tomato Soup. This is my mom's favorite way. 3. Parkerhouse Rolls. This is my sister's favorite way. 4. Eggs. This is my favorite way. Check out these other fantastic herb recipes today! You will be glad you did! If you are a blogger who would like to join our Taste Creations group, please email me at terri@terristeffes.com We would love to expand our group! I love, love herbed butter. It's perfect with steaks, soups and breads. I'd love to try all the recipes. I have heard about saving herbs in ice cube trays, but not in butter. This looks easy and so genius! I want to try this out for the winter, so I need to get some herbs to make this happen now! What a great idea! I'm a butter snob myself and I do grow fresh herbs :) . I don't do eggs, but I can see this on my some toasty sourdough. YUM! Oooh, I never thought of using the herbed butter on eggs! That's just brilliant! I'm such a herbed butter fan! My favorite is putting parsley and shallots in the butter. Perfect for steak! Looks good! I'll have to try making some herbed butter. Herbed butter sounds so delicious! I'm going to try this soon! I've been wanting to try this, I will have to use your recipe. I love how you gave suggestions for using it as well. My Husband teases me about how much I love herbed butter! It's my downfall at a restaurant with warm bread. If I make it at home, it'll be for an occasion! I'll pin this for the holidays. I really need to have an herb garden next summer. I have been thinking it for a few weeks and now you have convinced me! I had no idea about the wax paper versus the foil. I always use salted butter even when a recipe calls for unsalted. I also add salt to my butter at a restaurant if they serve unsalted butter with their bread, it just tastes so much better and if herbs are added that just goes to an even higher level. I agree about the salt and butter. I remember my grandma using 'sweet butter' for cookies but adding salt to the recipe. I wonder why she did that!? Yum - I've never made my own herbed butter it looks amazing and I bet it adds such a flavor to dishes! I love herbed butter! I love garlic and basil and parsley!!! I am a HUGE fan. I would love to try this butter! I have never made herbed butter before, but I am going to try this, it sounds amazing. I can't say that I eat herbed butter all of the time but it a nice special thing! Yours sounds really yummy. I bet it would be a hit for Thanksgiving this year! Honestly, I had no idea that unsalted and salted are wrapped differently! That's awesome, makes it easier to distinguish the next time. 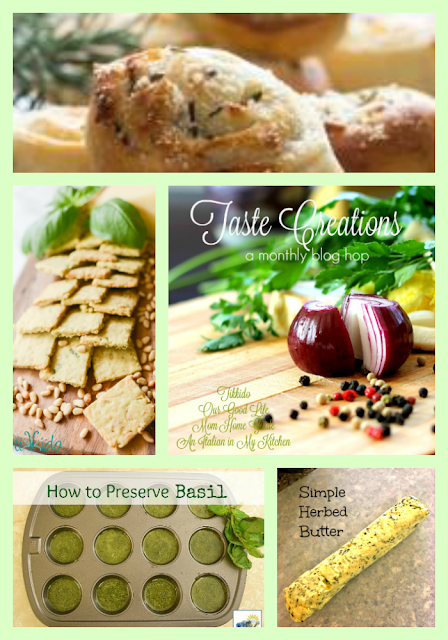 I love herbed butter and making your own sure is delightful! 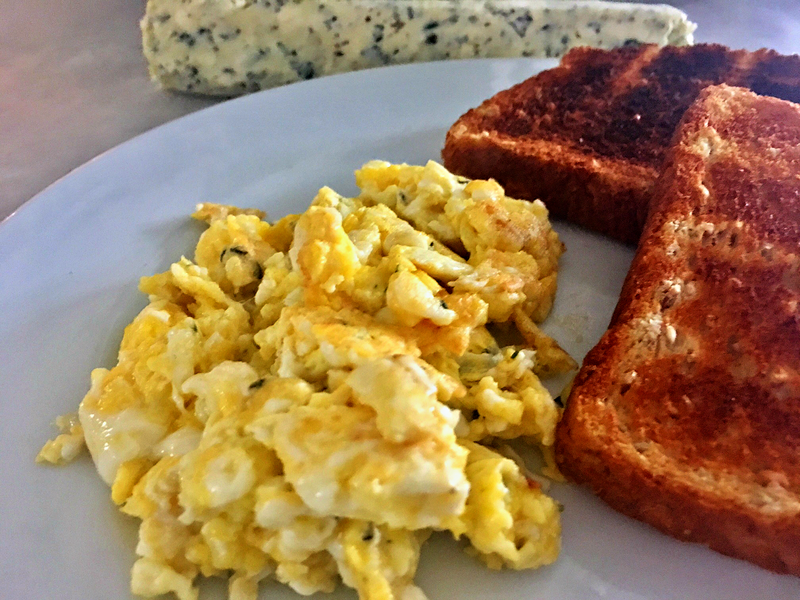 I haven't made herbed butter in awhile, but your post makes me want to go make some! Some herbed butter on steaks sounds so delicious! Yum! I love to do this! We make a lot of dill butter for fish, and then around Thanksgiving I make herb butter with sage and garlic for the turkey. It all freezes so well! I don't think I've ever sampled herbed butter before. I like the idea that the herbs are homegrown and that you can preserve it over the winter. Oh this butter would be fantastic on some warm cheesy bread or a steak. I will have to try this one. I love different kinds of butter. I've never made herbed butter before, but I do love going to restaurants and having it with my steak! Making it yourself is such a good idea! Wow, looks so yummy. I can't wait to try this, I will asked my mom to bake it for us. Yum! I've always wanted to make my own herb butter. I always thoguht it would be too hard. Now, I have to try it out! OH my. This looks so good. I have used herbal butter but never tried making it myself I think I'll have to try. My family loves herb butter! Yum! I love this idea, I have pinned this to try. I might make some tonight! I love herbed butter. It tastes amazing with bread rolls and a nice bowl of soup yum! Compound butters are one of my favorite things to make and herbs are a fantastic choice. You have inspired me I cannot wait to make some this weekend. I don't think I've ever had herbed butter before? But it definitely sounds right up my alley! This is such a great idea. Such an easy way to make your breads and snacks have just a little more flavor. I have never made something like this myself but have had some herbed butter before. Looks so good! Oh my! This on the eggs sounds absolutely amazing. I am definitely going to have to give this a try! 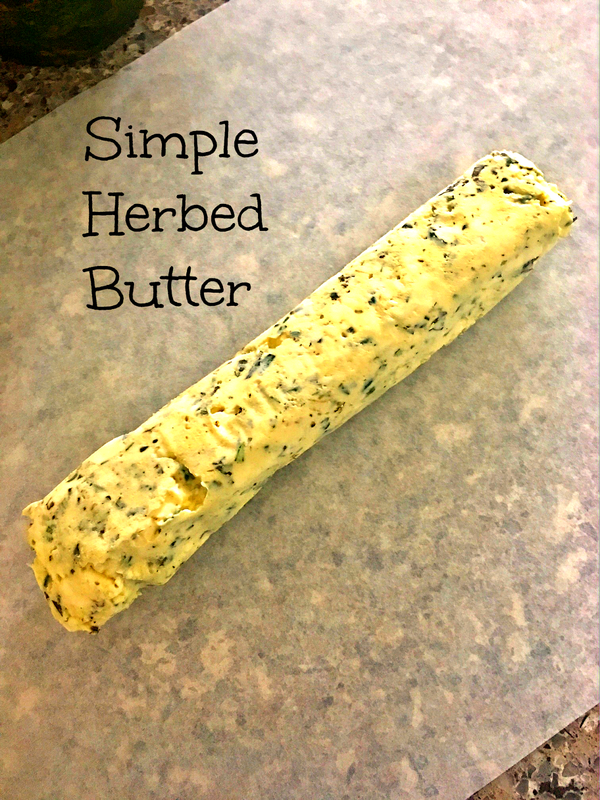 I never thought to make my own herbed butter as a separate recipe. My kids would love this I'm sure. I love how you've told a story with the recipe, personalized it and given it life. Makes me want to try it out!